ESP Easy is a free and open source MCU firmware for the Internet of things (IoT). and originally developed by the LetsControlIt.com community (formerly known as ESP8266.nu community). It runs on ESP8266 Wi-Fi based MCU (microcontroller unit) platforms for IoT from Espressif Systems. 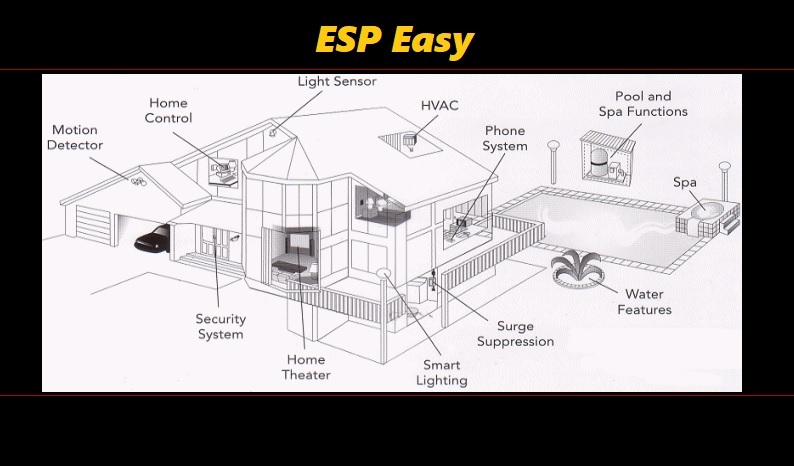 The name “ESP Easy,” by default, refers to the firmware rather than the hardware on which it runs. At a low level, the ESP Easy firmware works the same as the NodeMCU firmware and also provides a very simple operating system on the ESP8266. The main difference between ESP Easy firmware and NodeMCU firmware is that the former is designed as a high-level toolbox that just works out-of-the-box for a pre-defined set of sensors and actuators. Users simply hook up and read/control over simple web requests without having to write any code at all themselves, including firmware upgrades using OTA (Over The Air) updates. Developed by few Home Automation enthousiasts with some spare time to experiment on things like this. The RFLink Gateway is the most versatile device with sophisticated AI technology offering a bridge between wireless devices and your home automation controller. Many RF devices are supported, like switches, wall sockets, door, window, temperature, wind and rain sensors, electricity meters, etc. You can build your own low-cost RFLink Gateway (Arduino Mega + RF transceiver) and you can even help with development and propose updates and fixes. The RFLink Gateway could work with a mixture of frequencies like 315 Mhz, 433 Mhz, 868Mhz, 915 Mhz and 2.4Ghz (depending on frequencies used in your region). – Wireless turn lights on/off with a remote control, phone or tablet. – Catch wireless data from devices like weather stations and sensors. – Measure and report energy use. – Automatic and/or wireless control of sunscreens/windows/etc. In combination with a webapp that is specially designed for the Nodo, you can see and control everything through an easy interface. Available for smartphone, tablet or webpage. You can see things like temperature, air pressure, energy use, wherever you are.